To mark the 47th birthday of a television classic, Cathode Ray Tube goes right back to the beginning. A woman producer and a gay Asian director made this in 1963. Delia Derbyshire and her tape edits. Peter Brachacki and his console room. Bernard Lodge and his titles. 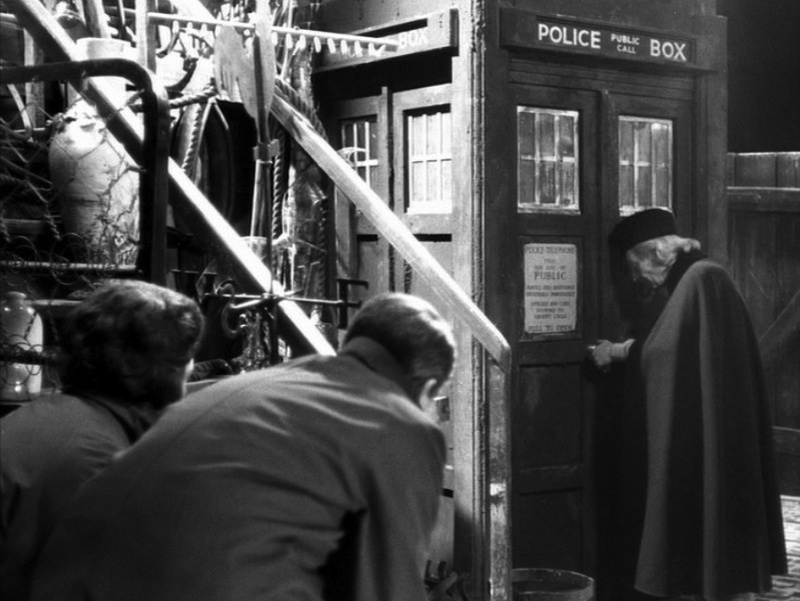 A police box that's bigger on the inside... in 1963. It was so extraordinarily experimental. So outrageously imaginative that it still grips you and never lets you go. Even 47 years later there is something so magical about the opening episode of Doctor Who. There's a school of thought that says an An Unearthly Child consists of an exceptional first episode followed by three rubbish ones about cavemen. I'm afraid I'm going to have to dispute that. For me, the story is complete in and of itself. The theme is clearly presented in both the settings of 1963 and 100,000 BC and explores how the technologically advanced appear to be god-like to those less developed, more primitive. It is central in the way this programme straddles the status quo of pre-Sixties culture whilst also recognising the revolutionary forces propelling Britain into the 1970s. 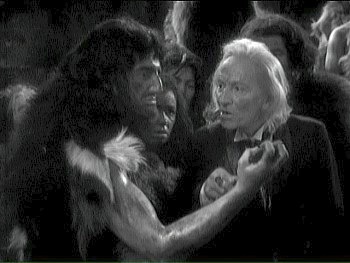 The first episode highlights this with Barbara and Ian's stumble into the TARDIS - contemporary humans facing a civilsation far in advance of their own - whilst the remaining three episodes switch this around and posit their own contemporariness in bold contrast to the tribe of cavemen who squabble over the power inherent in the knowledge of fire making. 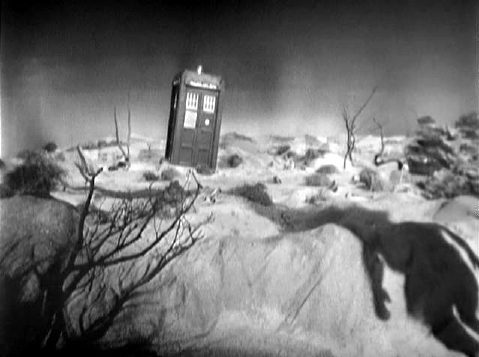 In that first encounter, the Doctor not only tests Ian and Barbara's understanding of the TARDIS's dimensionality by using television as an example to explain their arrival in an alien environment (which director Waris Hussein then visually illustrates by zooming in on the TARDIS scanner to depict the city of London shrinking into blackness to be replaced by a swirling vortex as the ship dematerialises) but he also likens them to the very primitives they all eventually meet in 100,000 BC. Looking at it now, it’s clear that, beyond the central mystery, the story is about ‘strangers in a strange land’ where two viewpoints dovetail neatly together. Ian and Barbara stumble into the world of the Doctor and Susan – 20th century primitives tangling with the surreal alien and god like environment of the TARDIS - and then the coin is flipped and through antagonistic sparring with this strange old man both teachers are flung back into time where they are those same gods to Kal and Za in a bleak, harsh landscape at the dawn of time. The gift of fire to the cavemen is the knowledge of the future, the journey in the TARDIS is the same knowledge but handed out to our erstwhile teachers. As this theme flip-flops through the story, Ian and Barbara remain the audience identification figures, our representatives. Knowledge is power whether you are aliens on the run, two teachers in 1963 or a bunch of cavemen. And a little knowledge can be a dangerous thing. What strikes you is how unfeeling and friendless this first Doctor is. He positively detests the presence of the two teachers, argues the toss with Susan and blames everyone else for the situation they end up in. And piled up on top of this conflict and power struggle is the strange, surreal mystery of the Doctor and his TARDIS, of the extraordinary machine hidden away within the dull, fog enshrouded junkyard. 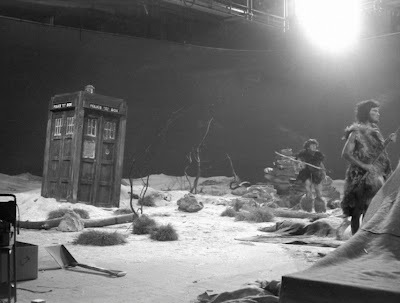 The TARDIS in the junkyard is such an iconic concept that the series will return to the scene of the crime, as it were, either in intriguing ways (Remembrance Of The Daleks) or in utterly crass ways (Attack Of The Cybermen). The original scene remains iconic, the copies do not. It's Baudrillard's simulation theme, making Doctor Who a truly postmodern series. And iconic images start to stack up - the TARDIS in the desolate plain after its journey from London and the shadow of a caveman falling across it, the chiaroscuro leaping of shadows as the flames lick round the skulls in the cave, the flight through the forest to the 'home' of the TARDIS. Waris Hussein makes camera moves that shouldn’t be possible with that old tank like camera equipment. He dares to move around the set, dares to use dissolves and tracking shots. It’s an amazing piece of television. He gets some very assured performances from his cast too. William Russell and Jacqueline Hill are very good indeed and even though we ridicule Hartnell now for his fluffs, here he’s electric, almost sublime, and invests the central mystery figure with a sense of desperation, anger and detachment. He puts his stamp on the role straight away. Carole Ann Ford was a true find, giving us an elfin like alien girl who does strange dances to 60s pop music and assumes we’ve gone decimal. She plays devil’s advocate between the Doctor and the teachers and tries to find common ground for them all. It's interesting to note how An Unearthly Child has a great deal to say about technology and the future, about class and power. Within the context of the story these themes show how dominance is achieved by primitive man through fire-making and equally by how the Doctor and Susan represent the achievements of the 'white heat of technology' to Ian and Barbara. It is not only a story point but also a theme that is bound up with the actual production of the story. For much of An Unearthly Child and the very concept of Doctor Who is born out of the rapid changes taking place in post war Britain. One of the overwhelming factors in the success of the series at that point would be its approach to design. The Festival Of Britain in 1951, concerning itself with the construction and reconstruction of national identity as expressed through cultural events, artefacts and buildings, is another huge influence on the early design of Doctor Who as well as some of the subtexts with which the programme surrounded itself. The Festival put forward an optimistic view of the future of Britain and Britishness and how a traditional nationhood could embrace the modernist world. Peter Brachacki, the designer who created the iconic TARDIS interior, is a key figure in the history of Doctor Who and like the mysterious émigré figure of the Doctor it is ironic to note he reflected the Festival's own showcase, where “a considerable amount of work... was by designers and artists who had escaped fascism and settled in England”. Highly intelligent people on the run. Sound familiar? The influence of William Cameron Menzies designs for Alexander Korda’s film of H.G. Wells’ Things To Come, itself paying homage to the works of Fernand Léger, architect Le Corbusier and Bauhaus legend László Moholy-Nagy, can be seen in Brachacki's concepts for the TARDIS. The roundeled walls, hive-like in nature, were clearly inspired by the ‘form follows function’ Bauhaus school of thought with their clean, crisp, geometric patterns that make simple but effective use of shape and mutual integrity. The console itself is of great importance, especially the central column. This clear column rises and falls whilst the TARDIS is in flight, the interior mechanism is a collection of geometric shapes, mobiles, lighting that turns, flashes and rises and falls at the same time. In visual terms it is clearly influenced by Moholy Nagy’s kinetic light sculptures, his set designs for Things To Come and his moody photographs of contemporary glassware. Finally, the banks of machinery in the background that we see more clearly in the transmitted version of An Unearthly Child and the console’s array of switches and dials are most definitely inspired by the brutal, modernist designs of the Magnox reactor UKAEA station at Calder Hall, later Windscale, opened by the Queen in 1956. There is no doubt that newsreels of such an event would have provided some inspiration for the design as there was nothing more futuristic and powerful in the general public’s mind than Britain’s first atomic power station going on stream. Britain’s atomic future was here a symbol of strength, imagination and the nation moving forward into the 1960s. So, Brachacki’s original design was powerful, modern and, ironically, timeless, seizing on those virtues that the modernist designers held above all else – a European based, almost avant-garde, higher order of form, function and composition that would transcend obsolete ornamentation. 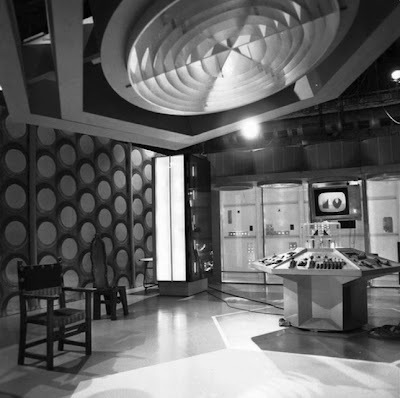 The sense of traditionalism being superseded by modernism in Britain in 1963 was no better expressed by having Barbara and Ian cross that threshold between the mundane, everyday exterior of the battered police box and Brachacki’s avant-garde, interior space of tomorrow. The fog bound, ordinary streets of London give way to futuristic control rooms and later to the barren landscapes of 100,000 BC. And with that journey Ian and Barbara take on the upward mobility of their lower-middle class origins and represent our own fearful and hopeful view of the future. It is a future rooted as much in the past as it is about the delivery of fresh and innovative ideas and the debut of Doctor Who in 1963 is very much part of the so called 'Long Sixties' (that period of 1958 to 1974) described by Arthur Marwick where new subcultures and movements, generally critical of, or in opposition to, one or more aspects of established society, doing your own thing, the rise of youth subculture, advances in technology and upheavals in race, class and family relationships all mark out the long journey from 1958 to 1974. Doctor Who represents both something of the culture that existed in Britain prior to the Long Sixties that was by no means destroyed in the events which took place post 1963, and yet it also celebrates human liberalist principles of the so called counter culture revolution to come. And that makes An Unearthly Child and the programme that developed from it for the next 47 years a unique piece of television. It is a fantastic story. I totally agree with you that the stone age part of the story really stands up. I like the 'cavemen' scenes just as much as the first episode. Do you know, Frank: after the numerous times I've seen this serial, I've never drawn that comparison between Ian and Barbara being confounded by the Doctor and the TARDIS, and the cavemen's similar awe of Ian and barbara. It makes so much sense - not only does the Doctor make the television reference, but he even talks about the "savage mind" of the Native American being unable to comprehend the locomotive! Such tight foreshadowing is a sign of impeccable writing. My god, it makes this 23-year-old wish he'd been able to experience the newness of the Doctor Who phenomenon right from the beginning! 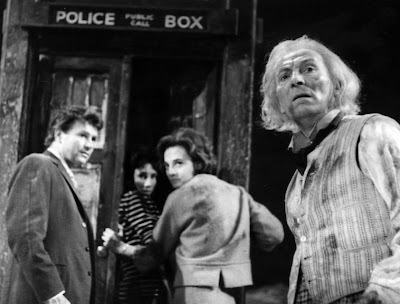 Late to the party here but I completely agree with your take on An Unearthly Child, especially with the latter three episodes being just as interesting as the first.